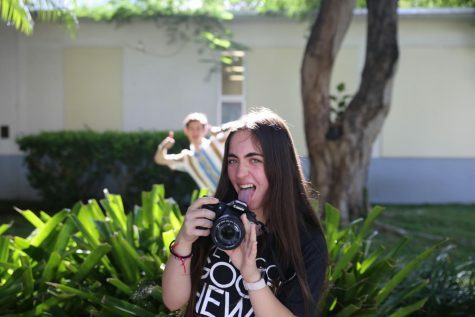 Emily Kay is a current junior in the International Baccalaureate Academy (IB) at Coral Gables Senior High School. She is ecstatic to have become a part of the 2018-2019 CavsConnect staff as a photographer. Kay hopes to greatly improve her photography skills through CavsConnect and she's very excited to get some nice shots. Those who are acquainted with Kay refer to her as someone who is humorous, energetic, lively, and spirited. Kay is a member of several clubs, such as: International Baccalaureate Honor Society (IBHS), SECME, and National Honors Society (NHS). When Kay is not in school, she is the Programming Vice President of Temple Judea, which helps contribute to her strong leadership and communication skills. Also, during Kay's free time, she loves playing softball with her teammates, taking photos of things the average eye doesn't capture, and watching films directed by Alfred Hitchcock. Kay, well known for her dry humor and tie-dye crocs, is extremely happy to be a part of the 2018-2019 CavsConnect staff.